Dom Lucilio does it again. ELK Bella Noire is one beautiful girl. Bella Noire is very typey. She has a compact body style with perfect conformation and bite. Her fleece exhibits a high frequency crimp with brightness and a silky handle. Her dam, Aurea, is a good mother, great milker and easy birther. 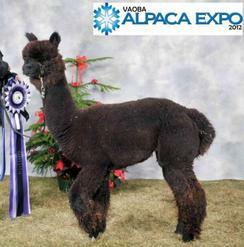 Bella Noire has the personality that we all want to deliver in all of our alpacas. She makes sure she welcomes everyone to The MoLi Ranch with a kiss. Bella Noire began her breeding career with a breeding to CNFF Man In Black. Bella Noire delivered a beautiful true black male named: Moli's Caesar on October 6, 2010. Little Caesar was born at 12.8 but by the time he celebrated hi two weeks of his life he was closing in on 19#. We thank Bella for being a very attentive mom with great milking ability and easy birthing. Watch for future updates on her first cria. Bella Noire delivered a beautiful female out of Snowmass Rising Sun on April 21, 2012. Moli Mystique Millennium will for sure be walking out on the show ring next Spring! Bella delivered another fantastic Man In Black cria but this time a female: Moli Oh BABY BABY... you bet she will be in the ring Spring of 2015. Caesar is a very nice true black male with a soft, dense crimp. He has great bone structure as well. Caesar has very strong genetics. Book your breeding to Caesar to get his genetics on your farm.